These guys killed it. I like it! Not quite as good as this version though. Seems like this is a lesser known Katy Perry video…..but it is still good. 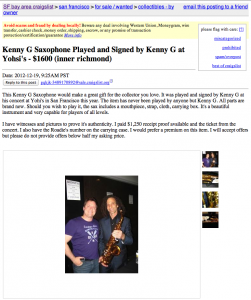 A Kenny G Signed Saxophone……. So, this was on my local Craigslist this morning. Seriously. Sad. So, I did a list of thing that you might consider getting for Xmas. But what is on MY list? Well, here it is. First thing is that I always need money. Who doesn’t? Running this site is not free, and the little money made with Google Ads does help with the phone bill, but not a lot. Money is always good. Second, I really could use more Hard Drives and an SSD. Hard drives for storing various projects and for backups. SSD for maybe doing an Apple Fusion drive Hack on my MacPro to get it performing better. Third, a better Tenor case. I have a SBK case that my tenor came in over 15 years ago. I would love to get something better for it. Fifth, Books. I still don’t have Greg Fishman’s Jazz Phrasing Vol. 2 and Vol. 3. Nor do I have the Duets Vol. 2 and Vol. 3 or the new Hip Licks Vol. 2. I like his books. Also there are some other miscellaneous books on my Amazon Wishlist (mostly oboe). There are a couple of other books on my radar, like Ben Britton’s new book. Sixth, Reeds. Always in need of a box of 3 Rico Jazz Select Filed for Alto, Soprano and Rico Plasticover 3s for Tenor. Eighth, iPad 4. I have an original iPad. It still works, but there are a number of programs that don’t run on it (cause it doesn’t run iOS 6). Ninth? Bari Sax with a low A? Sopranino? English Horn? Another song by One Direction. Yes, it is December. And I don’t think I’ve ever put up a Xmas song…..so here we go.